Cranberry sauce is one of those hit-or-miss recipes; people either love it or hate it. The trouble is, many people have only ever eaten cranberry sauce from a can, that jiggly, wiggly, jelly-like stuff that pops straight from the can in one large lump that needs to be broken apart with a spoon. Yum. Freshly made cranberry sauce is a totally different experience, and the flavours can be changed to suit your individual tastes. Depending on my mood and what I'm serving, I'll add nutmeg, cloves, cinnamon, oranges, or any number of different flavours to complement the wonderful tartness of the cranberries themselves. 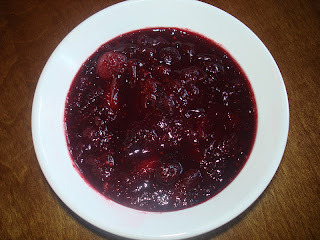 I can't imagine a Thanksgiving dinner without a not too tart, not too sweet cranberry sauce to add flavour and colour to my Thanksgiving plate. The cranberries pair well with turkey, potatoes, stuffing, and any other side dish that needs a bit of a boost. So forget the can, and in a few short minutes you can make a cranberry sauce to convert even the biggest sceptic. The photo doesn't do the sauce justice. The colour is a deep ruby red, with a nice, thick consistency. Here's the recipe for the cranberry sauce I'll be serving this Thanksgiving. 1-2 clementines, peeled and pulled apart. Throw in the rind of one clementine as well. 1- Place all ingredients into a small pot and stir to mix together. Use 1/2 cup of orange juice to start, and more later if necessary. 2- Bring to a boil, then lower to a simmer. Cook until cranberries burst and liquid evaporates to desired sauce consistency (my sauce took less than 30 minutes from start to finish). Taste and adjust flavours before removing from heat. Some people like their sauce a little sweeter than others, so add more sugar if desired. 3- Remove from heat and let cool. Remove the clementine rind before serving. Can be served cold or warm. I like my sauce thick, almost like a jam, with the cranberries almost completely dissolved into the sauce, so I let it cook right down. This way, I can put any leftover sauce on gluten free toast or crackers for a great leftover snack.